Moodily lit , gently washed veggies, posed for your pleasure. Weekends = brunch. Brunch with friends this past weekend was an at home affair of hastily cooked scrambled eggs, value-pack sausages, caramelized onions, white buttom mushrooms (ok this was legit) and lots of leftover fancy-ish baguette from Marche. Now what does one do with half a baguette. Eat it all with a big hunk of melty butter? 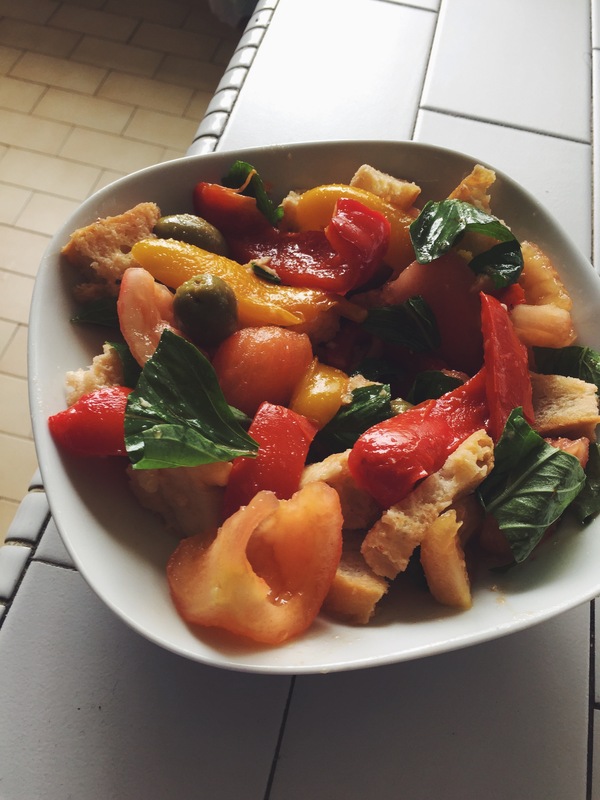 Tempting, yes, BUT being the culinary overachiever I am/compulsive creative food finisher, I decided to make Panzanella, an Italian bread based salad that was inspired by my flatmate, Mel’s mention of how good the dish was when she had visited Sopra. 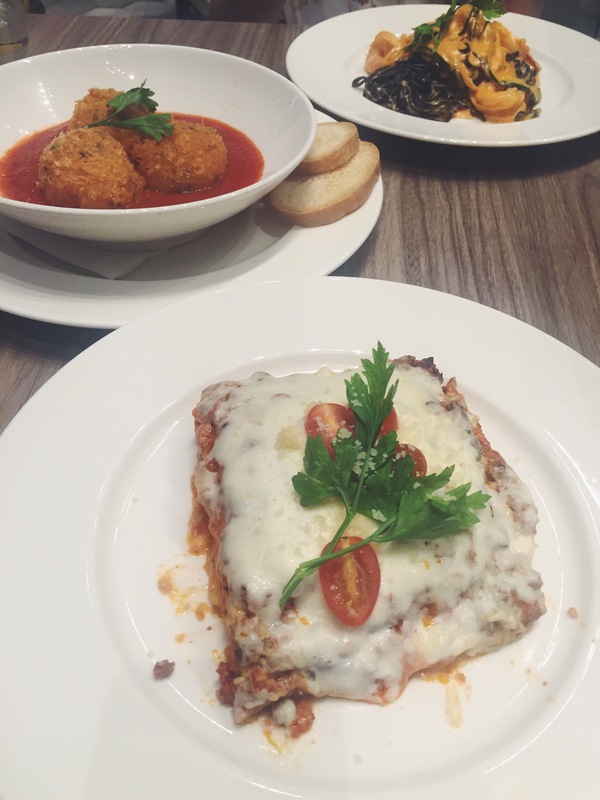 I didn’t get to got to Sopra that one time because I was probably vegetating at home. Still the fact that I missed out on this bready wonder, really bothered me. These baguette remnants was my chance at redemption, absolution. And a carb party FOR ONE! Drizzle a splash of olive oil over the peppers and roast for about 15 to 20 minutes, or until the peppers are softened but not charred. Place them in a bowl and cover with cling film for about 20 minutes. Blanch the tomatoes by plunging them into a saucepan/jug of boiling water for one minute, or until the skins start to peel away. Take out the tomatoes with a spoon that has holes and dunk into a bowl of cold water. Once cool, the skins should easily peel away easily – it did for me! Cut the skinned tomatoes into eighths. Remove the seeds and push the seeds through a sieve over a bowl to extract the juice. Put the tomato eighths into the bowl you intend to serve the salad in. Peel back the cling film and gently peel the skin from the peppers. If this is difficult or the skin does not come away easily, it means you haven’t roasted them long enough. Discard the seeds from the peppers. Cut the flesh into large strips and put in the bowl with the tomatoes. Mix the olives and capers with the tomatoes and peppers. Rip the bread into large chunks and put aside. Mix the vinegar, garlic and two tablespoons of extra virgin olive oil with the tomato juice. Use as much oil as you think is necessary. Add salt and pepper to taste and stir to combine. Add the bread pieces to the bowl and leave for at least an hour so that the bread soaks up all the juice. After an hour mix the ciabatta with the tomatoes and peppers. Tear in the basil leaves and using your hands gently combine all the ingredients. * Recipe adapted from Bon Appetit and BBC. 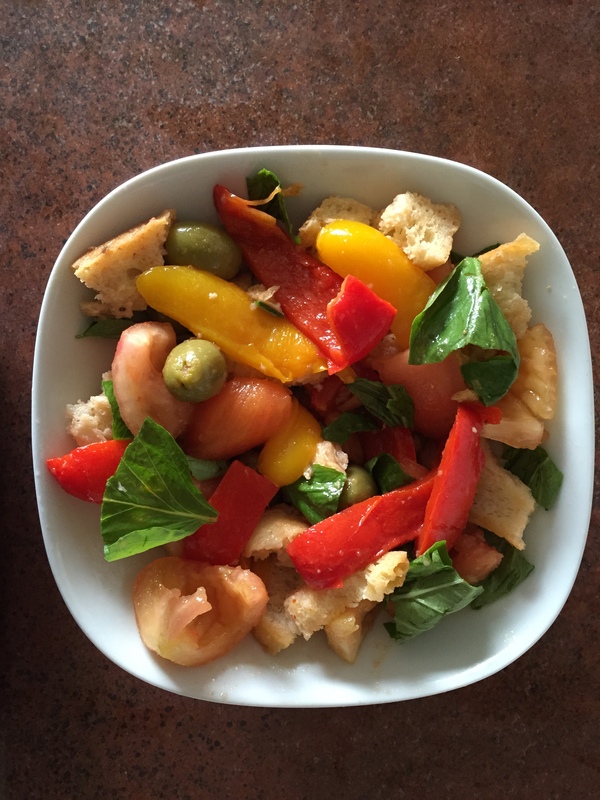 Author dinibliniPosted on October 12, 2014 Categories RecipesTags Bread, Healthy, Italian, Peppers, SaladLeave a comment on PanzaNELLA! This takes super long to make. But it’s worth it. So you know. So plan ahead, and don’t think, oh yeah I’ll just whip this up for dinner! BECAUSE YOU WILL NOT BE ABLE TO. Add liquid – let it evaporate. Look at all this WORK. Ok actually it takes about three hours to prepare but it’s crazy simple. 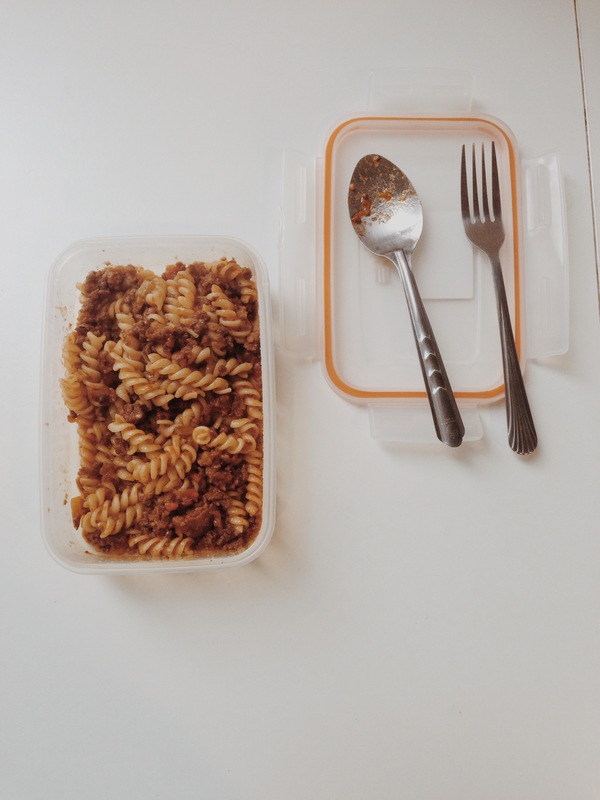 You just need some time and you will have a rich, spicy, decadent meat sauce that can last you for days. Or you know, a week if only one person it eating it. Heat oil in a large heavy pot over medium-high heat. Add onions, celery, and carrots. Sauté until soft, 8 to 10 minutes. Add beef, pork and bacon. Sauté and break up the bits until brown for about 15 minutes. Add wine and boil one minute. Add 2 cups chicken stock and tomato paste; stir to blend. Reduce heat to very low and simmer, stirring occasionally, until flavors meld, about 1 1/2 hours. Bring milk to a simmer in a separate saucepan. Gradually add to the sauce, stirring. Cover sauce with lid slightly ajar and simmer over low heat, stirring occasionally, until milk is absorbed, about 45 minutes. Add remaining chicken stock at this time. *You can make this two days ahead and then when you want to eat it just rewarm it. You can also freeze it in individual portions. You can do a dance with it. Really it’s up to you.